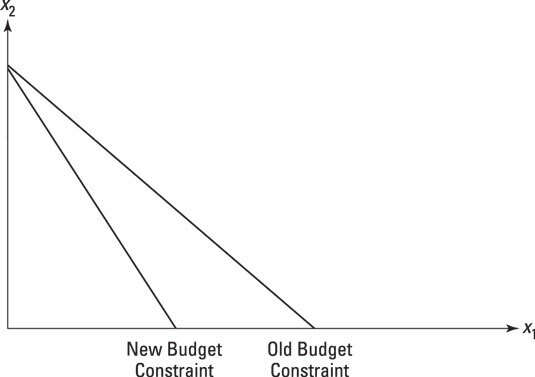 Changing income shifts your budget constraint up or down, or if all the prices of the goods you’re interested in change at the same rate, your budget constraint shifts up or down in a similar fashion. But suppose that some prices change more than others. It’s more likely that some prices go up and others stay the same rather than all prices changing by the same percentage. In this case, you need to look again at the formula for the budget constraint to see how this kind of change affects your feasible consumption. For instance, take the current consumer price index for the U.S. For urban consumers, the price index increased 0.3 percent in June 2015. The food index posted a large increase due in part to a sharp increase in the price of eggs, and the energy index rose for the second straight month as the prices of gasoline, electricity, and natural gas all increased. However, the prices for medical care, household furnishings and operations, used cars and trucks, and apparel all declined. A price index is based on a very broad sector-based approach to measuring household consumption, and when you look further into the data, you find that the prices of some goods rose and some fell, and so the overall average picture masks these changes in relative prices. Relative price changes have an important effect on consumer behavior as they cause substitution between goods. Suppose you’re deciding to take a break from work for a nice hot beverage. Suppose further that coffee has become relatively more expensive. Then, under some circumstances you may find it worthwhile to substitute some of your consumption of coffee for tea, preserving your overall level of satisfaction. When the price of one good, say coffee, or p1, increases, and the price of the other good, p2, tea, stays the same, the budget constraint changes. But instead of a shift, the constraint rotates so that it becomes steeper when the price of good one has risen. The figure shows you how you can take account of a rise in the price of coffee. A rise in the relative price of coffee draws in and twists the budget constraint. A rise in the price of any particular good is similar to a fall in income, because it reduces the number of opportunities to consume. However, a rise in the price of one good (relative to another or all others) restricts the choice of bundles to ones in which the more expensive good is more constrained.